India is the second most populated country in the world with nearly a fifth of the world’s population. The current population of India is 1,356,563,420 as of Monday, September 03, 2018, based on the latest United Nations estimates. Even though being a country with a large population has the advantage of large manpower, the major problem is the transportation. Recently, I had travelled to my relative’s house for a weekend, after spending the weekend, on return, I had to catch a train at early morning in the nearby city (because there is no direct train available ☹️), so I waked up earlier and packed up to catch a bus. Even though I know the train timings, I literally don’t know about the bus timings, I preassumed that there will be a bus for every half an hour, but I ended up missing the train because of the lack of knowledge about the availability of the buses. Since it is early morning there is no timekeeper in the bus station and so I ended up standing alone in the bus station and waiting for the bus. A problem can be solved in many different ways, (ie) more than one solution can be stated for the problem. In this case, the solutions might be improving the overall transportation facilities, Increasing the number of Buses, Redesigning the transportation of all city and so on. I decided to choose a solution which is simple, easy to implement and has low implementation cost, and so decided to design a mobile application with an intention of solving these problems. At first, I started searching the internet to find is there is any app out there to solve this problem, and I left with none. Since the Government had launched the campaign Digital India, I tried to find any websites or application regarding these problems. mparivahan app, which offers digital RC and Driving licence. Digital India app, which offers many services, among them, we can able to pre-book the express government buses, but only in 10 states of India. Mostly the Express Private buses and Government Buses provides prebooking and some of them provide GPS tracking, but these are not the buses that the people prefer to travel every day. 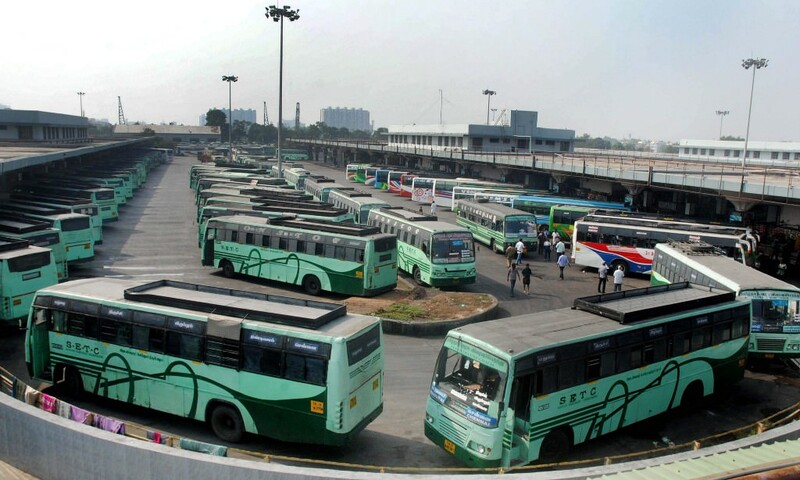 In India, the common mode of transport is the day to day Town buses and low floor buses. Most of the bus station has an updated bus schedule, since the bus service tends to change. This type of problem is more common in rural areas than in urban areas. At first, I divided the people depending on their daily travelling time. The interviews are conducted for them and their problems are analysed to know about their pain points. Going further through the research, I found 3 personas which have different needs and goals. By Summarising the research I’ve made, I came up with these pain points. Fallen asleep in the bus and missed the correct station. Bus availability (whether it is available, breakdown, punctured, Delayed) aren’t available. Unable to locate the current location, where the bus is travelling. The fare changes for each bus. Estimated departure is not available. The route that the bus takes to reach the destination, aren’t available. Unable to track the bus. Unable to find the nearest bus station in a new city. Starting from the pain points, I tried to find the different solution to solve them, I planned to keep the User Interface as minimal as possible to improve the look and feel and the overall user experience of the app. The primary colour of the app (#009688) is chosen in order to mimic the government bus colour, so that the people have the familiar sensation while using the application. By default, the app uses GPS to find the location and set the nearby bus station as the start point (user can change the start point, if they need). If the user makes a search while standing away from the bus station, the alert will be shown up and it will help the user to navigate to the nearby bus station (user can skip this process if they need). This will help the people, who are travelling in the new city. Some people prefer certain types of buses over others, they can directly search by Bus and find the availability of the particular bus throughout the day. The information about the availability of all the busses throughout the day are available here, they are sorted based on their start time. The details such as Bus name, Number, Type, Estimated Arrival and departure, fare and its rating are shown is a simplified way. This will helps the user to pick their preferred bus. By tapping the filter on the bottom right corner, the user can able to sort the available buses. The user can also able to switch between the different date of travel. This screen allows the user to track the bus and the information such as the typical bus route, Live GPS tracking, Estimated arrival and departure timings, info about the bus are available in this screen. By default the focus is set for the upcoming bus station, if users required the details about the previous bus station, they can click on the unveil bus station button. The bus availability is also updated in this screen, (ie) whenever the bus gets a breakdown (or) punctured (or) delay, it will be notified, so that the peoples, who are waiting for the bus can be aware of the bus delay. The Toggle can be used to change between map view and transit view, since the map view consumes more data, by default the view is set for transit view. Most of the people fallen asleep during the travel (me too! ), their problem is to wake up before the bus reaches their bus station. The ordinary alarm can’t be used, because the estimated departure time may vary. Using this alarm, the user can simply choose their destination and the time, such that if the user chooses 08 min and if they picked the location as meelur, the alarm will begin to ring, just 8 min before meelur. One of the most tedious processes is to get back the right amount of fare from the conductor , we can solve this problem by implementing the UPI payment within the app. If the bus gets break-down in a middle of a roadway, the GPS can be used to locate the nearby Bus depot and the alternative bus can be redirected towards the route. we can implement the panic button on the bus, so that if the bus is in danger state, we can able to send the rescue team by locating its GPS position. The information about the seat availability can be updated by the conductor of the bus, so that the people who are waiting for the bus can be aware of the seat availability. In some places, the bus timing looks weird, for instance, there will be more than 4 buses will be available continuously in a route during 1 to 2 PM, then at 2 to 4 PM there will be no bus will be available in that route. This type of problem can be solved by creating a “Raise Problem” section within the app. This app requires only a GPS device, that is to be implemented on every bus, if the government came forward and take this initiative, then it will be a real game changer for many people. Thank you for reading! I Hope you enjoyed this case study. If you have any feedback, you can head below to comment section. Solving a transportation problem in India — a UX case study was originally published in UX Collective on Medium, where people are continuing the conversation by highlighting and responding to this story. Rajinikanth’s ‘Sivaji 3D’ to be released before Diwali!